This article discusses one of my key measures of risk for comparing BDCs. It is clear that investors prefer BDCs with lower effective leverage giving them higher pricing multiples and returns to shareholders. I will be using many of my BDC risk measures to apply ratings to their Baby Bonds. This article will begin to explain how I assess risk for BDCs and which measures I will be using for my upcoming baby bond ratings. As mentioned in the previous article, not all BDC bonds are rated by S&P/Fitch/Moody's and the ones that are do not have much variance between with either BBB or BBB-. I will be using typical measures used by the rating agencies but I will be including many other indicators related to portfolio/asset credit quality, leverage and asset coverage ratios, interest expense coverage ratios, etc. I will also be taking into account qualitative measures of management especially related to managing the capital structure as mentioned in many of my previous articles. This article will cover how I measure "Effective Leverage." As discussed in "BDC Leverage & Baby Bonds: Part 1," I am expanding my coverage of business development companies ("BDCs") to include Baby Bonds (also known as exchange-traded debt) for investors that would like to limit the amount of pricing volatility and overall risk in exchange for lower yields. This will likely be a long series of articles that will cover general baby bond topics as well as introducing investors to individual bonds offered by BDCs. Intro - "Baby Bonds For BDCs: Set To Rise?" Part 1 - "BDC Interest Coverage Ratios"
Part 2 - "BDC Baby Bond Yields"
Why is assessing effective leverage important? It is important for many reasons including the potential risk for loss of capital. This should be especially important for BDC equity investors as they are basically the last in line during a default situation, which is why I am starting to invest in baby bonds with priority (before preferred and common stock) and much lower pricing volatility. BDC assets are mostly debt and equity investments in other companies, and depending on the portfolio asset mix, there could be loans at the portfolio company that could take priority for being paid back (before the BDC investors). How is effective leverage measured? I usually do not get into the weeds with my articles but I will likely be referring to this article in the future. Measuring leverage for BDCs is not straightforward because they lend to other companies that might have additional leverage. There is a large difference between a BDC with a debt-to-equity ratio of 0.80 and mostly first-lien assets as compared to investments that might be subordinated to other debt or use off-balance sheet leverage for higher returns. Effective leverage takes all of this into account. 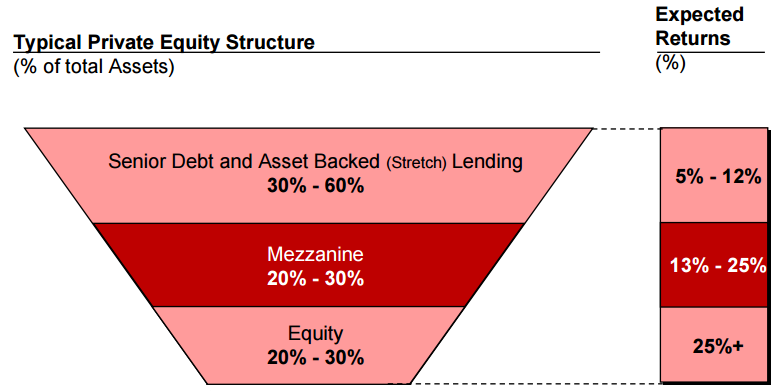 The following diagram is an oversimplified view of a capital structure that is highly leveraged considering there is only 20% to 30% equity. The following table breaks out a bit more detail including security and covenants. 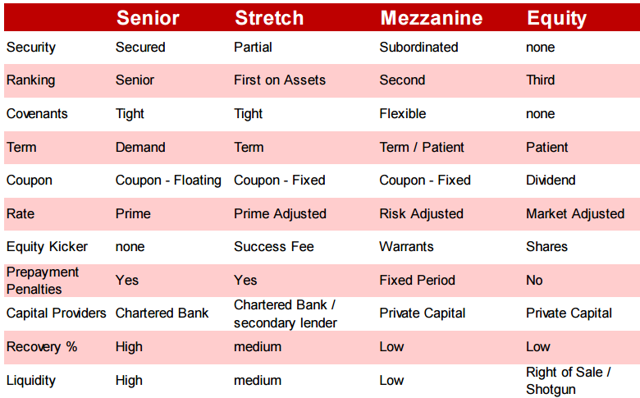 BDCs use similar terminology but would likely refer to the "Senior" as "first-lien" and the "Stretch" as "second-lien." 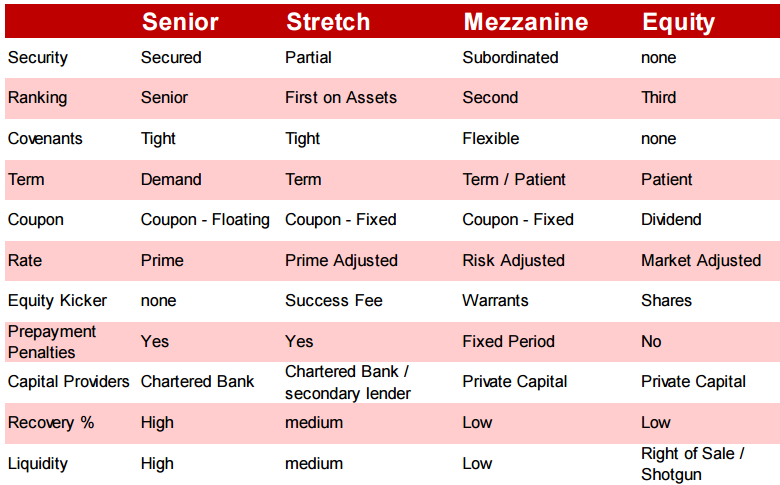 However, many contributors on Seeking Alpha lump first and second-lien together and call it senior because the detail is often hard to find for BDCs as there are very little standardized reporting requirements. It is also important to note that many of the higher risk BDCs will originate with lower protective covenants and/or security in exchange for higher yields, so not all first-lien is the same as I will discuss later. So how do we take into account all the leverage included in a BDC portfolio? Example: If you have a portfolio company with $100 of total capital, $40 of equity, $30 first-lien loan, $15 second-lien loan and $15 in subordinated loans, then the following would be the additional leverage applied. First-lien - no additional leverage as it is first in line. 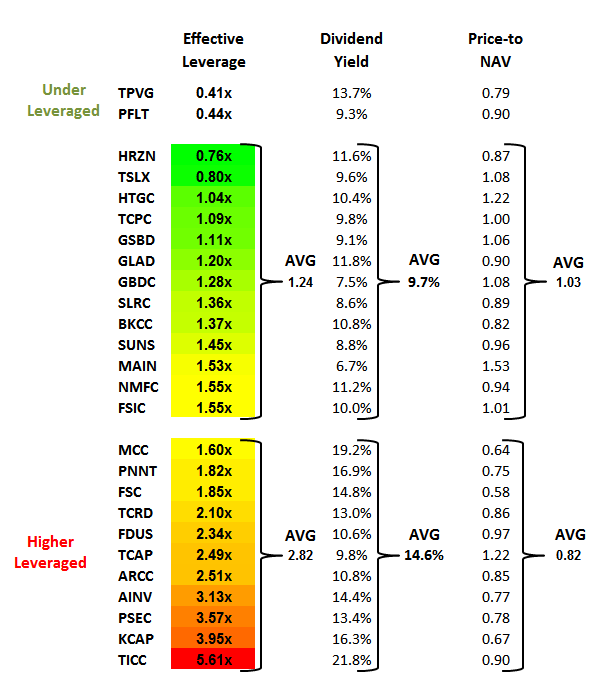 It should be noted that riskier BDCs will lend to higher leveraged portfolio companies for higher yields. So it is important for an investor to look at the yields for each loan and if possible perform a vintage analysis that also takes into account the timing of the loan to see if the BDC has been originating at higher-than-market yields. However, it is important to find out if the company has any off-balance sheet leverage through structured products including senior loan programs ("SLPs") that usually have 2x to 3x leverage and collateralized loan obligations ("CLOs") with 8x to 10x leverage. These investments are used to increase returns to shareholders but usually involve more risk and are considered "non-qualified" investments. BDCs are limited to 30% of the portfolio for these types of investments. NMFC has a small SLP and recently announced an additional SLP II with the potential leverage of 2.75x. 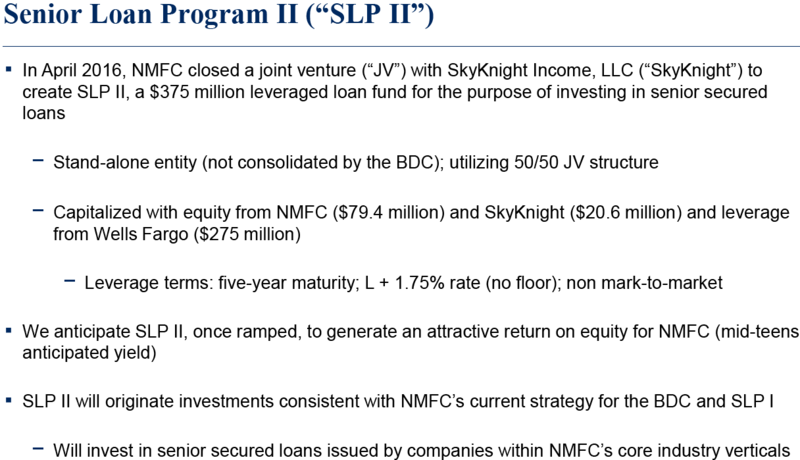 "SLP I is capitalized with $93,000 of capital commitments, $275,000 of debt from a revolving credit facility and is managed by the Company. The Company's capital commitment is $23,000, representing less than 25.0% ownership, with third party investors representing the remaining capital commitment. As of March 31, 2016, SLP I had total investments with an aggregate fair value of approximately $344,077, debt outstanding of $265,017 and capital that had been called and funded of $93,000." 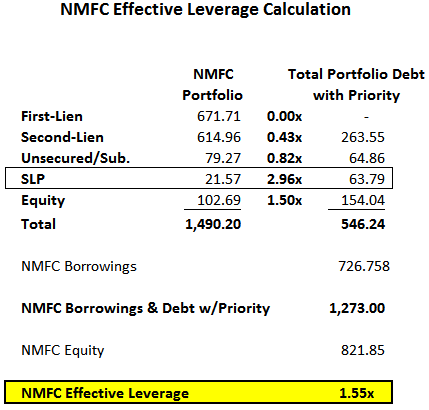 The following table uses the leverage ratios discussed earlier, as well as the SLP 1 leverage, to NMFC's portfolio allocation to calculate its effective leverage. Over the last few weeks, I have been digging through SEC filings to get the detail needed to calculate the following effective leverage ratios. As mentioned in previous articles, TriplePoint Venture Growth (NYSE:TPVG) and PennantPark Floating Rate Capital (NASDAQ:PFLT) have the lowest debt-to-equity ratios and are currently building portfolios to cover dividends. This has resulted in lower stock prices but is starting to rebound. Clearly, BDCs with higher amounts of first-lien loans and/or lower debt-to-equity ratios have much lower effective leverage as well as higher price-to-NAV multiples. This would include Horizon Technology Finance (NASDAQ:HRZN), TPG Specialty Lending (NYSE:TSLX), Hercules Technology Growth Capital (NYSE:HTGC), TCP Capital (NASDAQ:TCPC), Goldman Sachs BDC (NYSE:GSBD), Gladstone Capital (NASDAQ:GLAD), Golub Capital BDC (NASDAQ:GBDC), Solar Capital (NASDAQ:SLRC), Solar Senior Capital (NASDAQ:SUNS), BlackRock Capital Investment (NASDAQ:BKCC), Main Street Capital (NYSE:MAIN), FS Investment Corp. (NYSE:FSIC-OLD) and NMFC. As you can see, they have much higher pricing multiples and lower yields likely because they are considered safer and have higher quality assets. Fidus Investment (NASDAQ:FDUS) and Triangle Capital (NYSE:TCAP-OLD) have much higher amounts of subordinated investments than the other BDCs. PennantPark Investment (NASDAQ:PNNT) and Medley Capital (NYSE:MCC) are bumping up against a debt-to-equity ratio of 1.00x and higher than most but also have access to SBIC leverage. BDCs such as Apollo Investment (NASDAQ:OTC:AINV), Ares Capital (NASDAQ:ARCC), Fifth Street Finance (NASDAQ:FSC), KCAP Financial (NASDAQ:KCAP), Prospect Capital (NASDAQ:PSEC), TICC Capital (NASDAQ:TICC) and THL Credit (NASDAQ:TCRD) have higher amounts of structured products with various levels of leverage included. However, not all first-lien is the same! As I have mentioned many times, first-lien is not bullet proof and heavily relies on the quality of the origination/credit platform and management of the BDC. Poorly managed BDCs such as MCC and FSC have 50% to 60% first-lien but likely lower quality than most loans at the other BDCs. 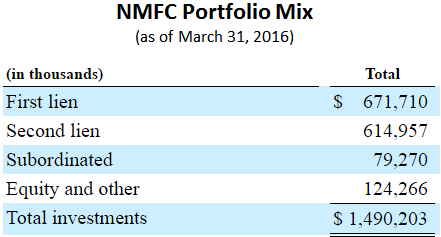 These two BDCs have had some of the largest net asset value ("NAV") per share declines and credit issues. There are many reasons for this and after a thorough vintage analysis, it becomes apparent that both companies have been originating at higher-than-market yields and/or during frothy periods. There is a good chance that they sacrificed protective covenants for pricing. As discussed in "Higher-Quality BDCs: TPG Specialty Lending," TSLX has an experienced credit platform focused on strong protective covenants and voting control to protect the downside risk for investors. The company has carved out a niche in the failing retail sector with asset-based loans ("ABL") that are covered during a default situation. 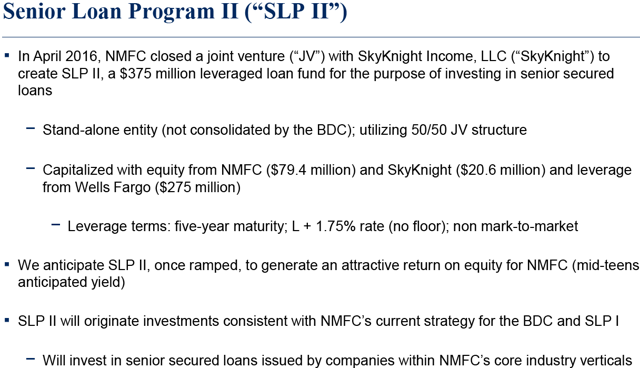 "Consistent with investment themes outlined on previous calls, during the first quarter we dedicated significant efforts in identifying retail asset-based lending opportunities, such as our first lien investments in Destination Maternity and Sears. These were opportunities in which we were able to provide loans secured by collateral of the highest quality and liquidity with favorable risk/reward characteristics. We will continue to explore attractive lending opportunities in this space as traditional brick and mortar retail gives way to the rise of e-commerce." I will discuss some of the typical measures for baby bonds along with my view of risk assessment when choosing these investments in the following articles in this series. For a list of all my articles including interest rate discussion, BDC rankings (risk, return, pricing, dividend potential), target pricing charts and valuations, individual dividend coverage potential, my historical purchases and current positions, and suggested BDC portfolios, please see my "BDC Research Page" and for my free monthly newsletter, please visit "BDC Buzz.com." Personal note: I have updated my positions to reflect changes in my holdings, but please keep in mind that some of the positions are very small and mostly for research purposes. Disclosure: I am/we are long ABDC, AINV, ARCC, BKCC, FDUS, FSC, FSFR, FSIC, GAIN, GARS, GBDC, GLAD, GSBD, HTGC, MAIN, MCC, MRCC, NMFC, PFLT, PNNT, PSEC, TCAP, TCPC, TICC, TPVG, TSLX. I wrote this article myself, and it expresses my own opinions. I am not receiving compensation for it (other than from Seeking Alpha). I have no business relationship with any company whose stock is mentioned in this article.